1. Which field in an IPv4 packet header will typically stay the same during its transmission? 2. What is the purpose of ICMP messages? 1. What is the purpose of issuing the commands cd nvram: then dir at the privilege exec mode of a router? ...VoIP...defines the protocols and technologies that implement the transmission of voice data over an IP network. 1. How many host addresses are available on the network 172.16.128.0 with a subnet mask of 255.255.252.0? 2. 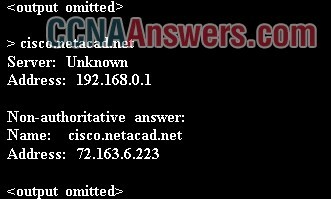 How many usable host addresses are there in the subnet 192.168.1.32/27? 1. When will a router drop a traceroute packet? 1. A host device sends a data packet to a web server via the HTTP protocol. What is used by the transport layer to pass the data stream to the proper application on the server? 2. What does a client application select for a TCP or UDP source port number? 2. Which statement about router interfaces is true? A configured and activated router interface must be connected to another device in order to operate. A store-and-forward switch always stores the entire frame before forwarding, and checks its CRC and frame length. A cut-through switch can forward frames before receiving the destination address field, thus presenting less latency than a store-and-forward switch. Because the frame can begin to be forwarded before it is completely received, the switch may transmit a corrupt or runt frame. All forwarding methods require a Layer 2 switch to forward broadcast frames. 2. Open the PT Activity. Perform the tasks in the activity instruction and then answer the question. 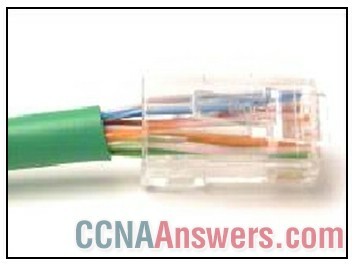 What destination address will PC1 include in the destination address field of the Ethernet frame that it sends to PC2?